SPY is an unconventional, fun-loving family of athletes and artists committed to creating exceptional optical products. Established in 1994, we are an independent Southern California-based company. We design products—sunglasses, goggles, and prescription frames—that take style cues from the outdoor sports community we’re engrained in, as well as the lifestyle that surrounds it. Our exclusive Happy Lens technology is the only lens on the market which harnesses the beneficial aspects of long-wave blue light, while offering protection from short-wave blue light known to damage the eyes. The Happy Lens name comes from independent studies which have shown that long-wave blue light can positively affect a person’s mood and alertness. I didn't realize that the Soft Matte Black style meant that the plastic on the glasses would be a little rubbery/grippy. Even so I really like the feel! Other than that they're good looking glasses, the first pair of Spy Optic that I've ever purchased. Love these glasses! They are so light! They have a slight cat-eye look which I love! Love these! High quality, stylish. The style and comfort were as expected but the performance of the lens regarding glare and light intensity is poor. The lens seems to only turn the environment a light shade of brown with with the same amount of glare intensity. If you're looking to buy glasses for bright sunny conditions as much as style and comfort I would not recommend buying these. I squint in the sun just as much with them on as I do with them off. Couldn’t be happier. The style, fit, and comfort are on point. Plus, you can’t beat the Polarized Happy Lens! These look great in person. The matte black is comfortable and stylish, and the fit is great. I have a larger head, and these are by far the best-fitting frames I've tried. They would also work for a Medium/Large head, no problem. The Polarized Happy Lens rules! I searched for the perfect shades for a long time. I wanted something kind of retro but not so gigantic that they rest on my cheeks. These are the perfect size. A little bit 80s retro and lightweight and comfortable. I ordered and returned 5 other pairs before I got to these and now I want to get them in every color. Really great shades for the price. LOVED THEM !!! A MUST ORDER!!!! I got these for my husband and he loves them. They look great on him. If you have a small head they might be a little big. My husband has a med size head and they are perfect. The 'Happy' lenses on Spy glasses are awesome, they really make everything look great. I love my Fiona's. Lightweight and nice fit. These are great glasses and a perfect style. The only problem is I did not realize that there was going to be such a problem with the polarized lenses. When putting on the glasses it really makes colors "pop" but I can't use them while driving. Also can't use them to look at the cell phone LCD screen. Item description says Made in Italy and received these yesterday and they say made in China! Glass fit great and the diemensions work for bigger faces/heads. Good style love the matte finish. Love these Sunglasses. I have a medium to small face and they fit great. The style is great and the function of the polarization is great. Wish Spy would bring back the Diablo. My favorite Spy sunglass ever. Soooooo glad I took the plunge and bought these!! They are slightly bigger than your average sunglasses, but I have very light-sensitive eyes so for me: the more coverage the better! They are very nice-looking glasses and comfortable. WOOOOOW! I love these sunglasses. Fashionable and the polarized Happy Lens is incredible. Best sunglasses I've ever had for sure. I can't explain how the lens works, you just have to try them on. Words do it no justice. Larger than they look but very comfortable. Overall a good affordable goggle however the lens did not appear to be silver mirror as advertised but more of an amber like look. Would have loved to keep these glamalicious sunglasses, however they were too tight on the bridge of my nose and the arms were too tight, giving me a headache. These are not made in Italy! Description states made in Italy but sunglasses I received are made in China! Sending them right back! far and away the best sunglasses I've ever owned. At times i forget i still have them on. The happy lenses are really worth it. How someone can give them a 2 star review when they ruined them themselves is beyond me. 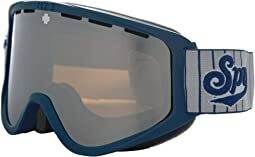 I absolutely loved my Spy ski goggles. They were comfortable and did not fog up, while I was skiing in Tahoe. They are adorable as well! Zappos was quick to deliver them, which was no surprise! Very nice sunglasses, clarity is amazing. The only con is when they are folded up they will not fit in the glasses department of a Dodge Challenger.